It seems trite to consider blogging about anything as everyday as sewing or gardening when so many Queenslanders are suffering right now from devastating floods this week. There are many photos of the destruction at news sites here and here, and a moving personal account here. There is sickening news today that one body was found 80 kilometres from where the person disappeared, and that in reality, some of the 50 people still missing may never be found. There are many stories too of courage and heroism in the face of danger, and of the amazing resilience of the Australian people. This photo gallery is wonderful testament to this. The lovely girls at Gumtree Designers have launched a wonderful appeal to contribute 'New Beginnings' sewing kits to the many crafters who may have lost all their possessions. You can find all the details here. 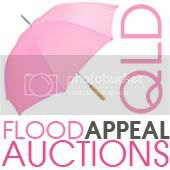 Toni at Make it Perfect is coordinating a list of bloggers willing to auction items for donation to the Queensland Government Flood Relief Appeal. The auction will commence on Monday 17th January, and will be open for 1 week, closing on Monday 24th January. Details can be found here. To those personally affected by this disaster, our thoughts and prayers are with you. We hope that you are being amply provided and cared for.